Los Angeles – Latino immigrants and African-American men are most at risk for being injured on the job, according to a study from the University of Southern California. Researchers examined data on 11.6 million people from the American Community Survey from 2006 to 2013 and 198,000 people from the Survey of Income and Program Participation for 1996, 2001, 2004 and 2008. 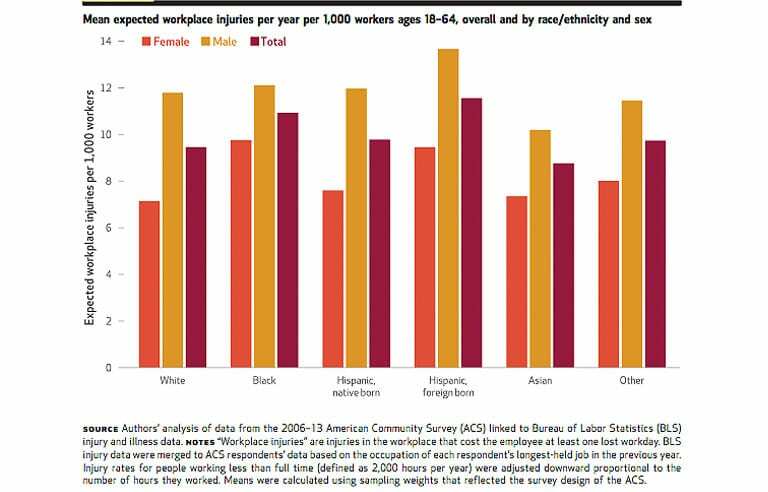 They found that foreign-born Latino men 18-64 years old have the highest average rate for workplace injuries, at 13.7 per 1,000 workers. African-American men were second at more than 12, then native-born Latino men at nearly 12, white men at 11.8 and Asian Americans at nearly 10. Other ethnicities have a rate of about 11. Higher workplace injury risk is connected to a higher disability risk, particularly for workers 50-64 years old, the researchers said. In this age range, African-Americans have a 4.4 percent rate of work-related disability, foreign-born Latinos were at 4.2 percent, Asian Americans at 4 percent, native-born Latinos at 3.5 percent and whites at about 2.5 percent. Possible factors that may result in differences in work-related injuries include bias in assigning minority workers to hazardous tasks and discrimination in hiring and promotion, researchers said, adding that policymakers and regulators may have to evaluate whether employers are assigning minority workers to risky tasks.